Farmers and ranchers across the nation – and especially in agriculture-rich states such as Texas and counties such as Erath – are concerned about President Trump’s proposed budget cuts on the U.S. Department of Agriculture. Farmers and ranchers could be impacted the most by the new budget plan. Russell Ilse, an Erath County rancher, said he worries about the future of agriculture. A newborn calf sticks close to its mother. 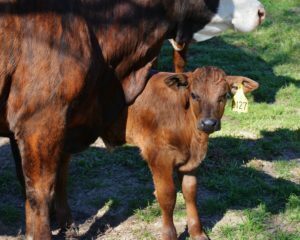 Spring conditions have been mild with good rain, which is setting the year up nicely for Texas beef producers. Photo courtesy of Texas A&M AgriLife Extension photo by Adam Russell. The proposed budget will cut discretionary spending in the Department of Agriculture by $4.7 billion, a 21 percent decrease from the current budget. It is not clear yet exactly which services would be cut by Trump’s new budget plan. The budget cuts would not have an impact on mandatory spending, so programs such as those that offer crop subsidies for farmers and the Supplemental Nutrition Assistance Program would not be harmed. But there are many programs designed to help young aspiring farmers and ranchers get their start, Ilse pointed out. “The number of farmers and ranchers is already being depleted, and cutting back on these programs would be a big step in the wrong direction to change that,” Ilse said. Trade with Mexico and Canada are other areas of concern. A recent report by Texas A&M University’s Center for North American Studies found that ag exports to the two countries totaled more than $3.3 billion last year and supported 18,674 jobs. Trump last week said he would not immediately terminate the North American Free Trade Agreement, or NAFTA, but would try to renegotiate it. NAFTA began in 1994. 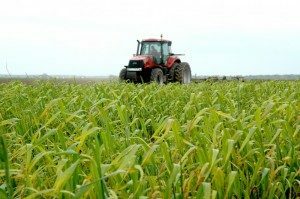 The total economic impact of Texas agricultural export trade to Canada and Mexico totaled more than $3.3 billion in 2016, according to research conducted by the Center for North American Studies at Texas A&M University. Photo courtesy of Texas A&M AgriLife Extension Service. The top four Texas agricultural exports to Mexico were beef and veal, cotton, sweeteners and corn. The top exports to Canada were horticultural produces, beef and veal, processed grain products and food preparations.